Common questions on Amish beliefs. What are some basic Amish religious beliefs? Yes. Though visibly different from most other Christian groups, the Amish are a Christian church which adheres to many of the same basic tenets as other Christian denominations. Amish origins date to the Anabaptist movement of the 16th century, an offshoot movement from European state churches of the time. What are some characteristic Amish religious beliefs? Social shunning, adult baptism, twice-yearly Communion, untrained ministers, the practice of footwashing, and non-resistance are among the beliefs and practices which make the Amish distinct from many other Christian denominations. Amish believe in non-resistance. This is somewhat different than saying Amish are pacifists. Non-resistance includes other uses of force, including law enforcement, legal suits, and wielding political power. This means Amish not only do not serve in the military, they also do not serve as police officers, run for political office, or file lawsuits. Read more. No. Not inherently. However, Amish believe that unfettered use of technology can lead to evil. Therefore they restrict the technologies they use. Some Amish use more technology, some less. This can depend on various factors including tradition, economics, and the worldview of the local church’s members. More on the Amish & Technology. Amish traditionally maintain boundaries between themselves and non-Amish, though it’s common that they have relationships with non-Amish as personal friends, business associates, and in other settings. Amish believe in adult baptism. 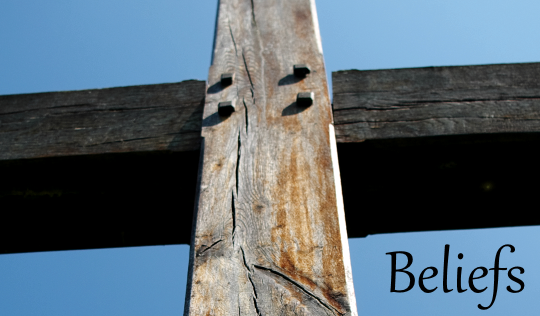 This was a fundamental issue leading to the formation of the Anabaptist branch of Christianity. Most Amish today choose to be baptized between the ages of 18-22, though baptism may occur at earlier or later ages. More. Most Amish do not profess a belief in assurance of salvation, in the way that a member of an Evangelical denomination might. Amish more often speak of a “living hope” of salvation. However, some Amish do claim assurance of salvation. This is most often seen in the New Order Amish churches. Amish believe social shunning is a Biblically-mandated practice that Christians are obligated to perform for the sake of their fellow church members. Excommunication and subsequent church discipline (Amish use the term Meidung for shunning) are intended to encourage an errant member to cease sinful behavior and repent, and also to preserve the purity of the church. Shunning is meant to be done in a spirit of love for the wayward brother, though that may not always be the case in practice. More questions on the practice. Amish do not generally purchase commercial insurance policies. A key tenet of Amish belief is reliance on community. Thus, the community bears the burdens of costs incurred due to medical expenses, disaster or other hardship. In the case of larger expenses that can’t be handled by the immediate community, Amish may reach out to members in other churches and settlements. Amish in some places have also more formally organized this assistance in the form of community-administered aid plans. Why don’t Amish work on Sundays? Can they do any tasks at all? For the Amish, Sunday is a day of rest and a day to honor God. This is why you see the “No Sunday Sales” signs on Amish businesses, and why it is always a day off for Amish people. However, certain tasks which have to be done, such as feeding animals or milking cows, are still performed. I see the Amish using technology and getting involved with worldly things. Isn’t this hypocritical? Some Amish may criticize other Amish for what they feel as “backsliding” or going too far towards the ways of the world. 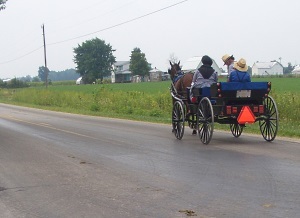 Different Amish groups are more, or less, progressive on technology. Even though they don’t always agree on how much is too much, most Amish have more beliefs and practices that unite them than divide them. Kraybill, Donald B., ed. The Amish and the State (2nd ed). Baltimore: Johns Hopkins University Press, 2003. Kraybill, Donald B, and Marc A. Olshan, eds. The Amish Struggle with Modernity. Hanover, NH: University Press of New England, 1994. To Cite this Page: Wesner, Erik J. “Beliefs.” Amish America. Erik Wesner, 23 Jan. 2015. Web. [Date Accessed]. <http://amishamerica.com/beliefs/>.